It's the most overdue and delayed upload of any movie, edit, experiment or short I made in film school. Elliot, the mockumentary I produced in my final core production class has been withheld for nearly 2 years, all for one reason. When you spend 8 months planning, writing, shooting, re-writing, re-shooting, editing, and polishing a project constructed entirely in the bubble of university-motivated independent film-making, by the time the project is done and the class is over you're not sure if you'll ever be able to watch your movie again. It has nothing to do with the movie itself, the experience or the people who shared it, but instead with the process of deconstructing and over analyzing your work to the point of endless frustration, and the realization that your movie will never quite be perfect enough. From September 2006 to April 2007 my mockumentary was simply 'in production', a loose term used to cover all the behind the scenes bargaining that goes into creating a movie with little-to-no money and few resources. To be clear, much of the struggle was by choice. My final film could have been a 3 minute short, but instead I opted for a 38 minute narrative, a fake documentary no less, that required me to create a series of fake articles, covers, notes, and posters to tell my story - not to mention the fake debut novel, The Dirty Sailor. The challenges I created for myself didn't stop there. I recruited my friends Travess Durk and Taylor Croissant for the two lead roles, but they both lived in different cities which required extra planning to coordinate shooting. Even after production, with a half-hour screenplay I ended up shooting over 6 hours of raw footage that I had to edit, which in the context of a single class assignment meant I was dedicating more time to the project than was required. It may sound foolish, but I can honestly say that my motivation for the movie was based around creating the film school experience I hadn't had yet. I wanted to be invested in a project that couldn't be made in a few hours. I wanted to rely on other people to help expand the concept. I wanted to be able to share in the class screening process and have my project evolve into something more significant and memorable than the average assignment. But above all, I wanted a bookend for my film school experience. No rushed assignment would've felt fitting. So what did I settle on? 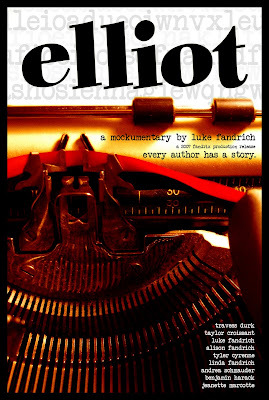 A comedic doc-within-a-narrative about author Warren Elliot and his quest to get into a prestigious national writing guild. I'd be lying if I didn't admit that my love of Christopher Guest movies didn't have some influence on my choice. So several days ago I finally re-watched, Elliot. My critiquing and concerns had subsided, and looking past the imperfections I felt really proud of what had been accomplished. After revising the movie so many times over the final weeks of that class, it felt good to finally just enjoy it as a viewer. In previous posts I've made reference to re-editing, Elliot or shortening it, but I abandoned that idea after seeing it again. True, this movie isn't perfect, but it is what it is for a reason. It marks the end of months of hard work and planning, and the culmination of lessons and tests from a final film class. Part of the reason for sharing my work on this blog, my online portfolio, is to show the evolution of my movie-making. Any changes I made now would be more for my sake, and renewing my view of the project, than it would be for serving the movie itself. What I love about Elliot is the banter. It's an interview movie, meant to feel literary and dialogue heavy without being dry; Warm and witty without being flashy or intense. People in class compared the interviews to Stewart or Colbert, noting the contrast in the delivery of actual information and the personal posturing in character development. In short, I guess it's largely about characters who do whatever they want, because they all just want to be right - and told so, obviously. At the end of April 2007 I felt happy to put the project behind me and was satisfied with the positive response I got from those in class and my friends and family who saw it. I handed out DVD copies with a selection of features as a memento. I'm pleased once again to be sharing, Elliot with a new crowd. I want to say thank you once again to all of you who helped me over the course of those two semesters in completing this movie. I hope you feel as proud as I do, because your help made it the positive experience that it was for me. Elliot can now be viewed for the first time in the playlist below. I've broken the 38 minute movie into 5 parts to make it easier to watch over several sittings if you choose. Take your time, enjoy, like that book on your shelf you've been meaning to read for months, the movie is here to stay. Excellent post! I really enjoyed it. I will be back for more! Ah I have fond memories of this during the 4th Year Film hand-in time period, watching it and the other projects at Tyler's house with you guys...including ones actually titled "4th Year Film", as you'll remember, haha. This is my favorite Luke movie though; possibly because it darker, lengthier, character/dialogue based as opposed to editing/shots/rythm-reliant (though those were definitely well used here as well), and one of a few peeks into what an actual Luke "movie" someday might look like. It looks good.